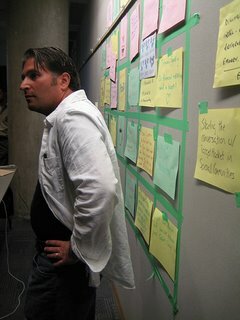 For the last two Septembers, Tim McAlpine, Gene Blishen and I have planned and put on BarCampBanks here in Vancouver. We have been discussing what to do this year and we think it’s time for new blood. 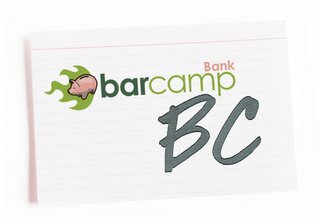 So here’s the deal: I’d love someone to step up and take over the planning of a BarCampBank here in BC. It’s a great event, but the three of us feel like we’d be re-hashing old territory and some new energy and ideas need to surface. Leave a comment if you’re interested, and we’ll go from there. BarCampBankBC2 was a local, reflective event. BarCampBankBC2 took place today. Tim McAlpine, Gene Blishen and I decided to make it a lower key, locally-focused event, given the economic times. It took place in the Vancity board room, and about 25 people from FIs and FI-related organizations took part in the conversations. The conversations focused a lot on co-operation, and, as often happens at BarCampBanks, the participants were mostly from the credit union world. We talked about co-operation amongst co-operatives, about innovating new products, about channel strategy, about pulling together our members’ data to help them understand their finances more easily. As I reflect, I think the main theme that emerged was the implicit or explicit barriers that are in place in our various organizations that hinder innovation, agility and sometimes even common sense. In some ways it was a ‘grass is always greener’ conversation where smaller organizations envy the resources bigger organizations have, and larger organizations envy the agility and lack of silos in smaller organizations. The wifi was spotty, and the conversations were involved, so there wasn’t a lot of Tweeting, but the Twitter tag was #bcbbc2, if you want to see the commentary. On a personal level, BarCampBankBC2 marks the end of one of the busiest periods in recent memory for me. Starting with buying our house, going to Bologna, moving, launching the League of Kickass Business People in Vancouver, Ivan starting Kindergarten, finishing a major business case to revamp our intranet and bring enterprise 2.0 to our organization, writing an online service experience strategy, driving Vancity’s co-op week activities, plus some critical business issues at work and, oh yeah, my day job. Summers are usually a little slower, but this one was jam packed, almost all with outstanding items, but slightly more than my plate could hold. It’s one of those times where I’m excited about all the different things I’m involved with, but I’ve still been looking forward to having some of them behind me and not in front of me. 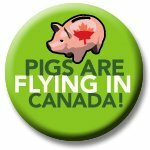 A note to those attending BarCampBankBC. Okay, what is this BarCampBank thing about? With BarCampBank coming up this weekend, we thought it would be good to let you know what we’re all in for. The first thing we’ll do on Saturday morning is a quick round of introductions, so we know who we have with us. Then, those of us who want to create a session will write it up on a piece of paper and stick it on a grid made up of times and rooms. Once we have the sessions on the grid, the people who wrote them up will give a short pitch to the rest of us. Then we’ll vote with our feet and join the sessions that interest us. If no one comes to a session, it’s cancelled. If someone wants to take up two time-slots in a row to create an extra long session, that’s cool. If you’re in a session that you’re not interested in, leave it and find one that you like better. The conference will be developed organically by all of us together. What often works well is to propose sessions around the things you want to discover and learn, not the things you have to teach. Curiousity is the name if the game. All participation is welcome (well except for pitches for specific commercial products or companies, and long-winded presentations). Participation, however, is not mandatory. If you want to listen more than discuss, that’s up to you. We are lucky to have a great mix of local BCers and people who have travelled from far and wide to participate. Some of us have been to a BarCampBank before, and many have not. We have all the right people and expertise to create a truly amazing weekend. The right people will show up and the right things will be discussed. At the end of day one, we’ll have a Pecha Kucha, where each presenter is allowed 20 images, each shown for 20 seconds, giving 6 minutes 40 seconds of fame before the next presenter is up. If you want to do one, come with your presentation on a USB key. Thinking of live blogging or taking photos? Oh yes, breakfast will be provided both days, and lunch will be provided on day one. On September 20th, we’ll start at 9am and wrap up at 5pm. On September 21st, we’ll start at 9am and wrap up the whole thing at 1pm. Please come on time, so you can participate in creating the sessions. We’ll be at the BCIT Downtown Campus, 555 Seymour Street. PS: Here are two great resources.